Gemma Varnom takes a second glance at Black Mirror‘s ’15 Million Merits’ and ‘White Bear’ episodes and wonders if we are inching ever closer to the horrifying and oppressive society they depict. Bing and Abby from ’15 Million Merits’ (left to right) stand behind a reflective table under a multiply squared ceiling light, with TV screens running along the walls to the left and right of them. They look glum and are wearing grey/beige uniforms. 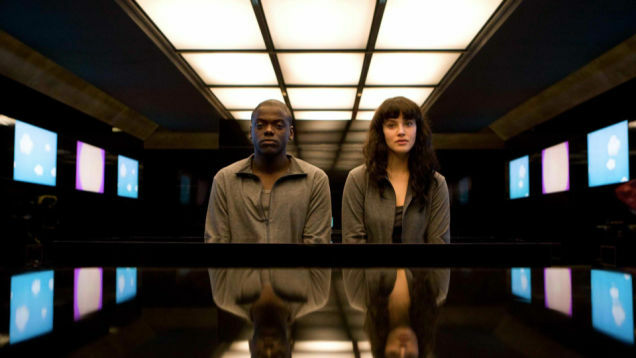 The image appears within the cover of the DVD for the complete first series of Black Mirror and is used under fair dealing.